What if achieving your desired healthy body and healthy weight wasn’t just about the food you eat? What if unresolved thoughts, feelings, and experiences are what drives you to make the choices you make about your body? This includes what you feed it, if you exercise it, and basically whether you treat your body as a friend or foe. Each one of us has gone through experiences throughout our lives that have been painful, fearful and heavy with emotion. Many people have experienced a significant illness, injury, loss, financial hardship, relationship or family conflict, and/or work or career related challenge. What’s weighing you down? What experiences from your life, past or present, feel heavy? What burdens are you carrying around? What’s weighing you down and preventing you from traveling with ease in a lighter healthier body? Click the following: Navigating The World of Emotions for safe ways to express your feelings. 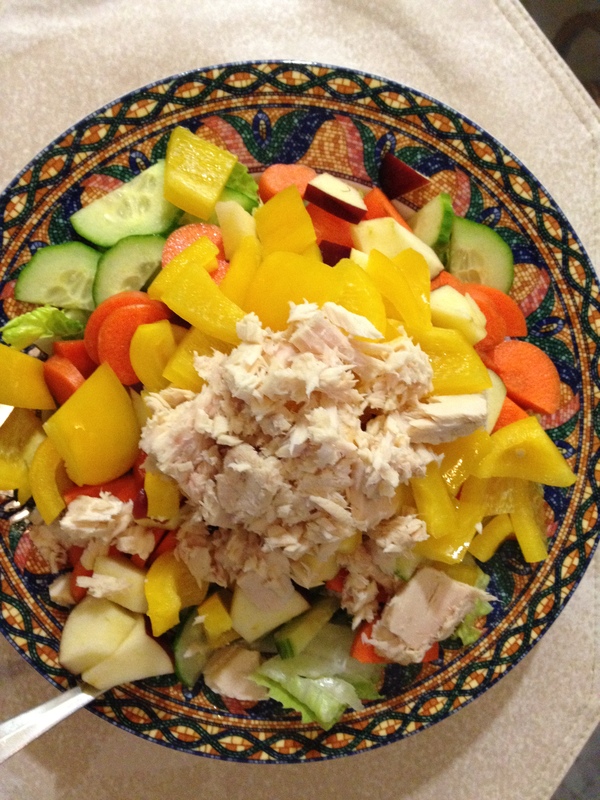 “If a little is good, more is better.” Many people believe this motto, especially when it comes to eating healthy food. Consuming a lot of one particular food or food group can cause two potential problems. One, you may be depriving your body of necessary nutrients; and two, you may end up eating too many or too few calories. 1. We can all agree that kale and spinach are good healthy foods. If the majority of your diet was made up of these two greens, you most likely would not be taking in enough calories or nutrients. 2. Eating multiple servings of almonds, walnuts, sunflower seeds, dried fruit, avocado or whole grains will lead to an excess of calories, and may leave you too full for other foods like fruit and vegetables. 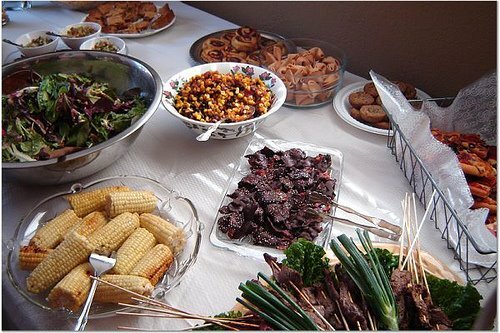 A potluck dinner is a great way to bring people together who have an interest in eating healthier, trying new recipes and having fun doing it! A couple of years ago I started a “Healthy Potluck” dinner club that met monthly at different homes. You’re Invited to a Healthy Potluck and Recipe Exchange! Our goal is to bring people together who have an interest in eating healthier, trying new recipes* and having fun doing it. *Recipes can be emailed, bring one copy if you want it scanned to be sent out. Bring plenty of the food you are bringing, along with some containers to take some leftovers home (unless we eat it all). Please RSVP by September 19th and I will forward the address to you! Get a few people together and enjoy some new healthy foods! Are You Aware of What You Eat? Do you make it a practice to read nutrition food labels and ingredient lists on the foods you buy? Do you have an idea of how much fruit and vegetables you eat in relation to processed foods? Living a lifestyle of healthy eating, that is, eating a diet made up primarily of real food, whole foods, fruits and vegetables, whole grains, beans, lentils, nuts and seeds, has been shown to provide optimal health. Switching to a plant-based diet, with small amounts of chicken or fish if you choose, has been shown to prevent and reverse food related illnesses that so many people suffer from by eating a diet high in fat, cholesterol, and sodium from eating too much fast food and processed food. 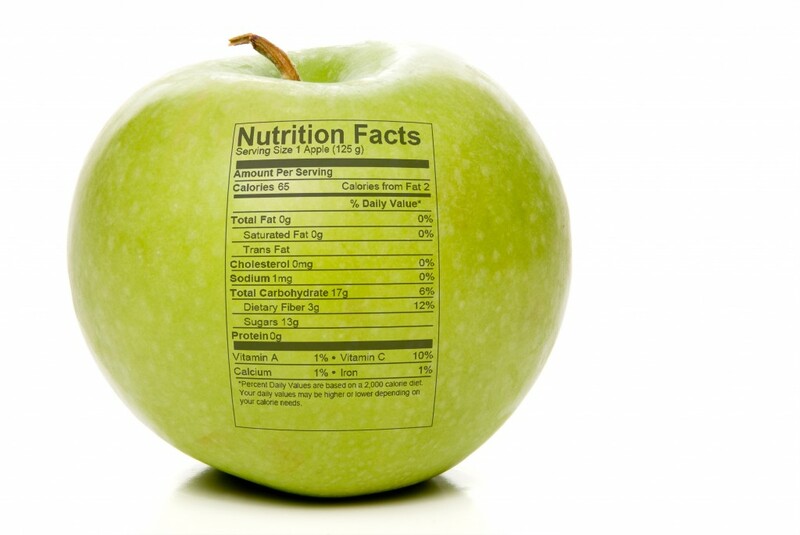 Getting in the habit of reading nutrition food labels will help you be able to see just how many calories you are consuming along with the breakdown of fats, sugar, cholesterol, sodium, protein and fiber. When reading the ingredient lists, remember that ingredients are listed in order of the most to the least. Keep in mind that there are many names for sugar and a food item will often show more than one form. Also, be on the lookout for ingredients you can’t pronounce or don’t know what they are. Beware, they may be artificial flavorings, colors, or other man-made chemicals to preserve and make the food item taste better. Stay informed for better health! Carbohydrates have been given a bad name for good reason. Most of the carbohydrates in the standard American diet are simple carbohydrates. These include refined white flour, white rice and sugars. Think of all of the products made from these ingredients. Simple carbohydrates are primarily empty calories that may taste good but leave you unsatisfied and wanting more because your body did not get the nutrients it needs in order to keep you functioning at optimal health. It really is like putting low-octane gasoline in a sports car that performs best on high-octane gasoline. Read the ingredient list on all packaged products to see that in fact they are made from whole grains. Look for whole grain or whole wheat breads, cereals, and pasta. 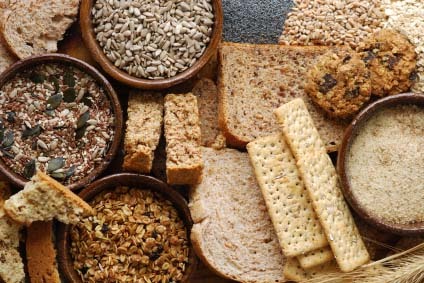 Other complex carbohydrates include brown rice, quinoa, barley, couscous, beans, lentils and peas. Family Fun Activity: Get a set of plastic measuring cups 1/4 cup, 1/3 cup, 1/2 cup, and 1 cup. Measure out the suggested food items below if you have them or substitute other items with similar serving sizes. 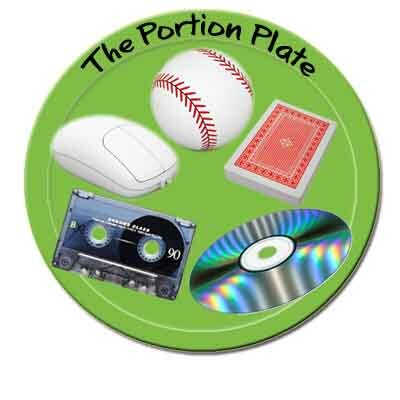 (See the Nutrition Facts food label for serving sizes on packaged foods.) Then put the food item in a bowl or on a plate so you can see what a serving size looks like displayed to eat. If you eat chips, count them out according to the serving size listed on the package, it is usually about 10 chips to a serving. Take a good look at what a serving really is. Are you surprised? 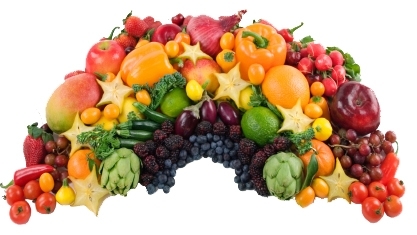 Healthy eating includes a variety of fruits and vegetables in a rainbow of colors. Apples, artichokes, arugula, asparagus, avocado, bamboo shoots, bananas, beets, beet greens, bell peppers (green, yellow, orange and red), berries (blueberries, blackberries, strawberries, raspberries), bok choy, broccoli, brussels sprouts, butternut squash, cabbage (red and green), cantaloupe, carrots, cauliflower, celery, cherries, chives, collard greens, corn, cucumber, dark green leafy lettuces (baby greens), eggplant, endive, escarole, fresh lemons, garlic, grapes (red and green) green beans, grapefruits (red and pink), honeydew melon, hot peppers, kale, kiwi, leeks, mango, mushrooms, nectarine, onions, oranges, papaya, peach, pears, pea pods, pineapple, potatoes, pumpkin, radish, rutabaga, scallions, snow peas, spaghetti squash, spinach, sprouts, star fruit, string beans, summer squash, sweet potatoes, swiss chard, tomatoes, turnips, water chestnut, watermelon, winter squash, yams and zucchini. How many of these have you tried? How many do you eat on a regular basis? What are your favorites? What sounds new and interesting to try? A variety of fruits and vegetables can be eaten cooked or raw, by themselves or in recipes. Some can be found fresh, frozen, or in a jar or canned. There are many health benefits to eating whole foods. Each fruit and vegetable contains hundreds if not thousands of phytonutrients unique to that food, in addition to antioxidants, vitamines, minerals and fiber. It really will make a difference to your health. If you don’t get enough of “Nature’s Medicine,” on a daily basis, you may want to consider whole food supplements. If you would like to learn more about whole food supplements click here.